Are you a huge fan of the skies? Or perhaps you’ll need to take a quick trip and fly across the city for a business meeting? Either way, the Beech BE60 Duke is just the aircraft to meet your flying needs. It has a sturdy pace so you can get to view landscapes, cities, mountains and bodies of water throughout your trip. It even has Short Take Off and Landing (STOL) capabilities so you can fly from or land to shorter runways. This crucial performance feature lets you have various options of airports to choose from. If you’re flying from Toronto, Canada, this aircraft lets you reach as far as Quebec, Oklahoma, USA or Bermuda. Its passenger seats are also comfy enough for you to enjoy your 1-hour trip. Know more about the specifications of the Beech BE60 Duke and charter for your very own, private plane today. One of the Beech BE60 Duke’s standard features includes a WiFi connection. With internet access, you’ll get to stay in touch with your family, friends and professional networks while flying. You can even send instant messages to coordinate, delegate and check on the latest project updates of your team members. Plus, you can use an online based app to track the progress of your ventures. 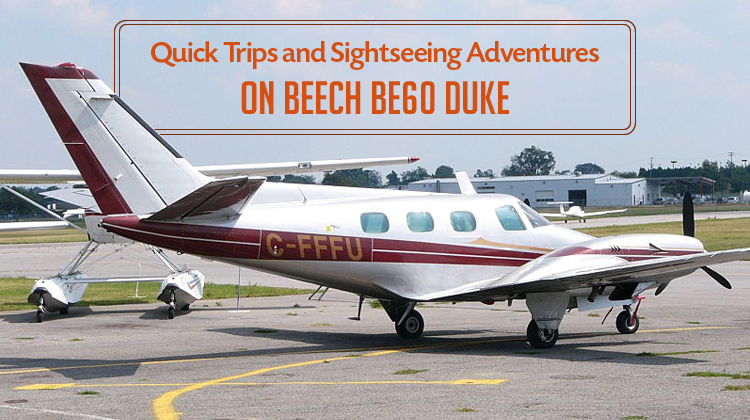 If you’re quickly flying for a meeting, you can still stay business savvy on board the Beech BE60 Duke. Additionally, you’ll even get to enjoy the sceneries which you don’t get to see every day. As you hop on the comfy seats and bright interiors of the Beech BE60 Duke, you’ll find this plane has quite a sturdy ride. Taking aerial breathers would be splendid on this aircraft, since its allowable altitude isn’t too high or low. It sufficiently balances its distance from the land and level of flight to the sky. This way, you can enjoy both the skies’ horizons along with the landscapes which you’ll be flying over. You’ll probably need to maximize the range of this aircraft on your next trip. In this case, you’ll need to confirm the aircraft’s allowable luggage weight and passenger count with your operator. As your routes and schedules get planned out, it’s practical to remember how lighter aircrafts can reach farther destinations at the fastest paces possible. Manufactured from Beechcraft Corporation, the Beech BE60 Duke had its first flight in 1966. It roughly has over 590 units built and being flown around the world. This plane is an addition of the Beechcraft Baron and Queen Air. Some of its units were also modified to fit the needs of its various applications. For instance, this aircraft’s engines were adjusted and replaced by companies which specialize in aircraft upgrades.